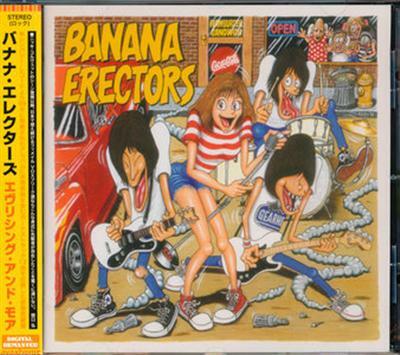 Under the spell of The Ramones, early 60's female pop-singers and '77 punk resulted in Japan's Banana Erectors. With an excited female vocals and sunshine mood drenched harmonies. Now this cult classic has been remastered & reissued, with 13 bonus tracks - this is a winner for sure. All the stuff and more! "There is very little about The Banana Erectors available online other than they hail from Japan, are female fronted by Masumi Toshikawa aka May are comprise (passing on full names) Ten on guitar, Nut on bass, and Hottie on Drums. Their style is variously described as fast friendly bubblegum pop punk, Japanese rock, power pop, and Ramonescore. They take their inspiration from the omnipresent influence of The Ramones and the 'girlie' punk group sound. The combination of May's high pitched pneumatically shrill voice that would comfortably strip the paint off the entire hull of an Aircraft Carrier, leading on frenetic three-chord power driven punk rhythms, resulted in a lot of attention on both sides of the Pacific in the late 1990's leading to this debut (and only) album in 1999 on american Sympathy For The Record Industry label. From this point they have seemingly fallen off the radar which is a pity as there is something quite catchy, quaint, different and energising about their take on pop punk. How they got the name 'Banana Erectors' cannot be tracked down but in any event knowing the problems experienced by the Japanese in pronouncing or should I say mispronouncing our language, it may be prudent from a propriety point of view, not to go too far in trying to resolve this question - who knows what might be the outcome? On one of the stand-out tracks, a really fantastic innovative version of Herman Hermits classic "I'm Henry The Eighth, I am, I am", 'Henry' becomes 'Hererly' which actually adds to the freshness of the track. In true Dee Dee Ramone fashion some numbers are are heralded with those immortal exhortations "One-Two-Three-Four" or in this group's case "One-Two-Flea-Floor"! Other stand-outs are "Fed Up With High School Days", "I Don't Wanna Be Alone Tonight", "Pretzel Eatin' Rocker" with a 'tissue over comb' hook that sounds like something from X-Ray Specs, the Partridge Family cover "I Woke Up In Love This Morning", and the very Ramonse-y "(Jenny Is) Looking for Flavor". Because this outfit's take on punk whilst good was very different to the norm and, perhaps out of my own comfort zone at the outset, originally after one complete play through I was only going to award 4 Stars, but after a second and third complete play through I am now sold on The Banana Erectors one and only album and am happy to give a 5 Star rating. The Banana Erectors - Banana Erectors: Everything And More (2011) Fast Download via Rapidshare Hotfile Fileserve Filesonic Megaupload, The Banana Erectors - Banana Erectors: Everything And More (2011) Torrents and Emule Download or anything related.